This sweet earthy Kale and Golden Beets Salad with Roasted Garlic Dressing is super healthy and tasty. Makes a great side dish or a light lunch. This is the season for golden beets. They are not as often seen as their red violet counterpart but I am happy that they are out on the shelves at my local health food store at this time of the year. If you find the taste of beets a little too earthy for your liking, you may want to try golden beets. They are slightly sweeter and have a subtler flavor. The other good thing about golden beets is that the bright golden color of the beets do not bleed and stain the other foods it is mixed together with. It will also not stain your hands or counter. This makes it a little less messy to handle. For this salad, I wanted a creamier dressing than my usual vinaigrette. Since I had to turn on the oven to roast the beets, I decided to throw in a bulb of garlic as well. I am glad I did because the Roasted Garlic Dressing was well worth the effort. It was creamy, sweet, and totally delicious! It combined very well with the roasted beets and baby kale. In case you are wondering, roasted garlic is quite different from raw garlic. Roasting causes the pungent and spicy flavor of raw garlic to mellow and sweetened considerably. Believe me, it is wonderful and you will find yourself liking it more than you think. One can definitely eat much more roasted garlic than raw garlic. 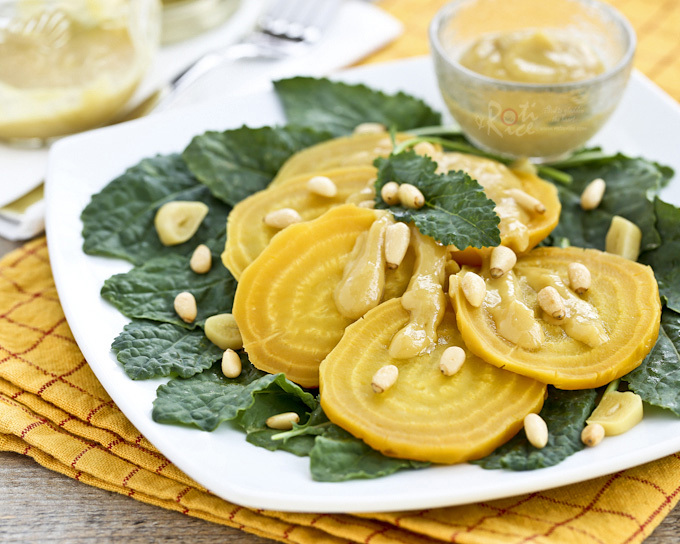 This Kale and Golden Beets Salad with Roasted Garlic Dressing may not be your usual everyday salad but it is a healthy and flavorful one. I enjoyed it very much and I hope you will too. Cut off greens from beets. Wash and pat dry. 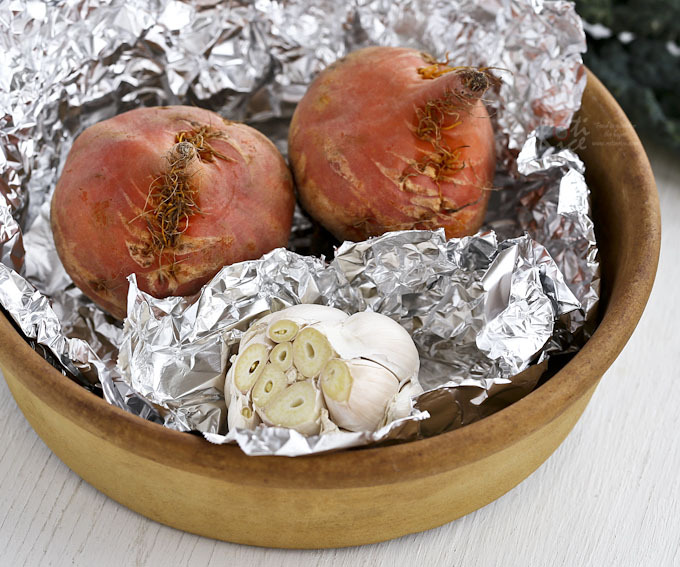 Place beets on a large piece of aluminum foil. Drizzle with olive oil. Fold the foil over and crimp the edges, creating a pouch. Peel away outer layers of garlic bulb, leaving skins of individual cloves intact. Slice about ½ inch off the top of garlic bulb exposing individual cloves. Wrap in aluminum foil. Roast beets and garlic for 1½ hours until tender. Remove from oven. When cool enough to handle, remove peel from beets. They should slip off easily. Cut into slices. Divide baby kale onto two salad plates. 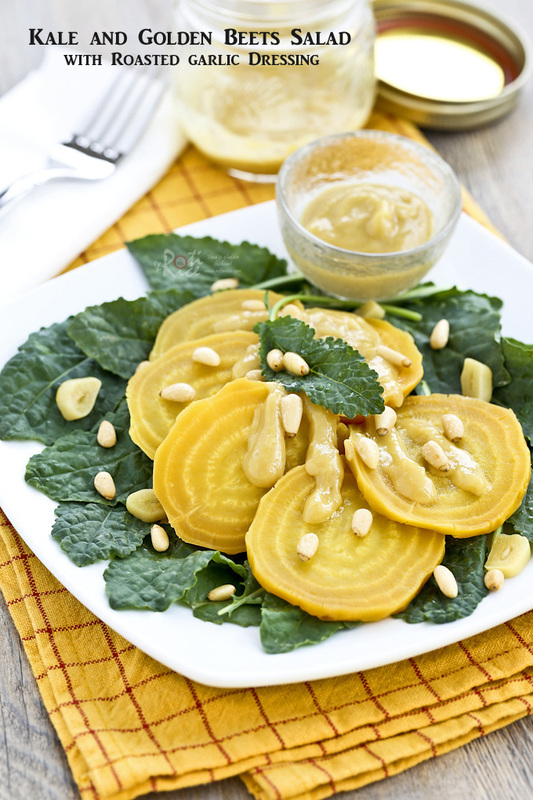 Place one sliced roasted golden beet on top of baby kale on each plate. Squeeze roasted garlic out of their skins. Reserve 2 cloves and cut into slices, if desired. Sprinkle onto kale and beets on salad plates. Transfer the rest of the roasted garlic to a blender. Add all dressing ingredients. Blend until smooth. Drizzle onto beets and kale. 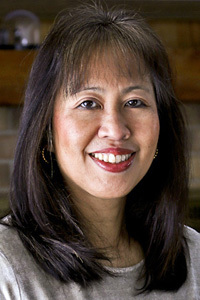 Hi Linda, not sure why but I had issues posting comments. This is my 4th try.. Sorry that the commenting system gave you problems but good to hear from you and know that you continue to visit and read. 🙂 Glad you found a recipe to try.